Well, it is here, the last day of my 30th year. I have to say it went by pretty quick. It really doesn't seem that long ago that I was posting the tests posts and the transformers posts. I hate that I did not post more of my year but blogging on a regular basis is just not my thing. I will continue to blog here but it will be random and irregular. Thanks for sticking around and maybe I will come up with some new material. Tonight I am 30 one more time. Tomorrow, on to 31. Sorry folks, I know I have not been around for ages and I am sure all five of my fans have given up on me but I am here now. I have been on ebay and some other websites and it got me to reminiscing. About what you ask? Cartoons of course. If you have read anything on here you know about my love to everything transformers and I do have the first two season of cartoons on DVD. What about others? M.A.S.K. - Kinda transformer like. I loved that the cars turned into battle stations and planes, helicopters etc. This was an awesome show, unfortunately there are not as many toys available on ebay today. The ones there are over priced, broken or missing key pieces, just as the characters or their masks. This show was a staple of my week day, after school, line up. I had most of the toys back in the day and would give anything to have some of them back. Thunderhawk with Matt Tracker, ahhh, the memories. The show was awesome and the toys were even more so. The combined my love of cars and transforming toys. 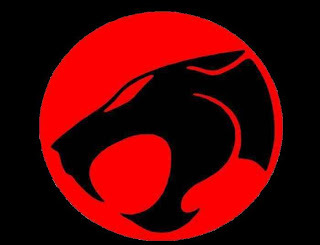 Thundercats! Loved this one too. Not sure why this one appealed to me as much but I think it was because they had cool weapons and cool vehicles. Whatever the case, I watched this one too. Rumor has it that they are trying to bring this one to the big screen. Please, make it not be true! I couldn't imagine seeing some actors painted like cats. Oh well, I guess it worked for the Transformers. Do you think Michael Bay could find enough places to stick explosives? Finally, in my trip down memory lane I ran across a bonus. Army Gear! Galoob, former maker of Micro Machines also produced this awesome line of toys. 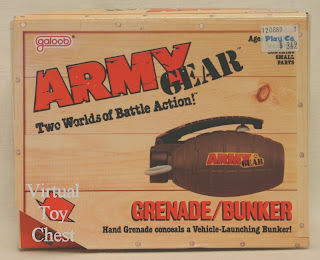 They appeared as "normal" army items, aka grenades, hand guns, canteens, etc but low and behold they were army playsets. I had several and wore them out. These toys are even more rare than the Mask toys. I have found a few on ebay but they are way out of my price range. I would love to have one or two but I can't justify buying a piece of my childhood at such a high price. Oh well, some memories are left just that, memories. So if you are reading this and have some of these toys and are willing to part with them, contact me. Well another milestone down. Finally we are getting settled into life in our new house. I will post some pictures soon! Ok, I know, I know, I am such a post tease. I post and claim that I will post again and then I leave you high and dry. Guess that is better than low and wet, eww! I digress, finally, I am going to share one of the last M&M wrappers from this summer's blockbuster, Transformers, Revenge of the Fallen. I bring you the last in the series of regular M&M's with Peanut M&M wrapper number 6 in the series. The sixth different bag along with Red, in his Delect-o-Con attire bring us Barricade. While I remember Barricade being one of the first transformers in the first movie and played a huge roll in recovery of the glasses from Ladiesman24/7, I do not remember him in the second movie. Maybe I missed him, maybe not but for some reason he is predominately featured here on wrapper number 6. Of all of the decepticons in the first movie, this was one of my favorites, mostly because he was a car. But Barricade was not just any car, he was a Salen edition Mustang cop car. I really like his side pannel that read "To Punish and Enslave", so try of their mindset. Anyway, enough rambling. I have one more bag to present as well as an interesting flavor. Details soon...I hope. Coming soon, the wrap up articles for the Transformer/M&M's promotion for revenge of the fallen and possiblly some entries detailing some of my toy purchases associated with this latest movie. Don't hold me to it though! Starscream...you disappoint me! Classic line from the transformers series. Megatron utters this often to Starscream both in the original cartoons and the most recent movies. This being said, have no fear, this bag does not disappoint. How could peanut M&M's disappoint anyone? Bag #5 in the Revenge of the Fallen/M&M team up features the power hungry Starscream teamed up with Yellow from the Delectocon team. Really if you think about it, this is an odd pairing. Starscream is all diabolical and Yellow is so laid back and unassuming, maybe that is why they were put together. Starscream wanted to be in charge. Hmm...regardless this was a tasty bag and the revamping of Starscream in the movies was awesome!